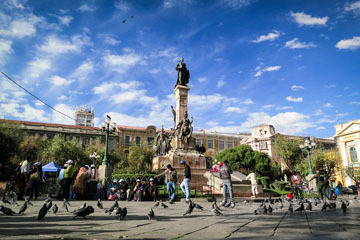 A1 Overseas International ships to Bolivia! Call 1-800-450-5319 or fill out our form for a FREE quote! There are many reasons why people travel outside of the U.S. Whether it is for work, school or permanent relocation, your time and money will be better utilized if your vehicle is available during your stay in Bolivia. Fortunately, A1 Overseas International is a dedicated global automotive shipping service that offers reliable shipping options for lower rates than other shipping companies that are considered far less-than reputable. Since they continue to provide positive results, they have become a leader in the international automobile shipping industry. A1 Overseas International has been flourishing since 1992 and has transported countless vehicles to ports around the world including Bolivia. If your vehicle meets the specifications, A1 Overseas will ensure a safe voyage for your car. Cars older than four years are not allowed to be imported into the country. Trucks, busses and commercial vehicles are not permitted to be imported. Shippers must obtain an import clearance form issued by the Bolivian Customs Department. Shippers must provide proof that they own the vehicle. Vehicles that are not cleared of liens are not eligible for international shipping unless the shipper can provide written authorization by the lienholder. Proof of registration and your driver’s license are needed before a vehicle can be exported. To fully grasp how beneficial it is to have a personal automobile with you in Bolivia, you can check out customer reviews online. For more details on customs regulations and international auto transport, contact a representative over the phone. The information that you provide to the agent helps them determine the cost of vehicle shipping or if your vehicle is even eligible for international travel.